Since 1992, Colgin has produced highest quality wines from exceptional hillside vineyards in the St. Helena area of Napa Valley. These unique sites, coupled with meticulous vineyard management and neo-classical winemaking techniques, produce wines with distinctive personalities. Colgin currently produces four first growth quality red wines: Tychson Hill Vineyard Cabernet Sauvignon, Cariad Napa Valley Red Wine, IX Estate Napa Valley Red Wine and IX Estate Syrah. 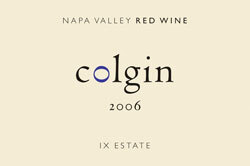 All of the Colgin wines are made at the state-of-the-art winery located at IX Estate.